During a recent conversation with a friend regarding tutorials for Adobe Lightroom it became apparent that he was oblivious to much of the online material provided by Adobe. In particular, the existence of Adobe TV and the recently introduced PHOTOSHOP.COM community support forums. This is unfortunate as the material is quite extensive and regularly updated. With many products the material is accessible from a link within the application Help menu (e.g. 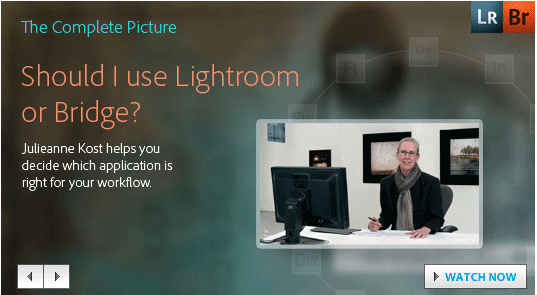 Lightroom Online… and Photoshop Online…), which, you would think, should make them relatively easy to access. Sadly, it seems that this may not actually be the case. Adobe TV is a particularly useful resource as it provides a comprehensive range of high quality video tutorials on Adobe’s range of products. The following is a short list of the various online learning resources available on Adobe.com. Hopefully, you’ll find them useful. This entry was posted in Adobe, Adobe Photoshop, Tutorials, Video. Bookmark the permalink.